The Soyuz TMA-05M capsule, carrying Japanese astronaut Akihiko Hoshide, Russian cosmonaut Yuri Malenchenko and US astronaut Sunita Williams, parachuted through dark, cloudy skies and touched down at 7:56 am local. The capsule blazed a red plasma trail across the dark sky after re-entering the Earth’s atmosphere. It landed on its side on the snow-covered steppe 52 miles northeast of the town of Arkalyk in northern Kazakhstan. 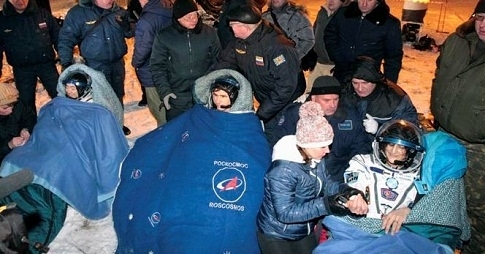 The astronauts were extracted quickly from the capsule and wrapped in blue thermal blankets. All three smiled and appeared relaxed as they chatted with the search-and-recovery team, Nasa TV footage showed.